Marketing automation has grown a lot in recent years, but just how much? According to Emailmonday, between 2017 and 2018, most B2B companies—58 percent of them—wanted to start using marketing automation to grow their businesses. Those who don’t, which is far fewer, are certainly falling behind. As you know from reading this blog, marketing automation can be incredibly beneficial for small businesses, mid-sized companies, and Fortune 500s alike. This Crazy Egg article reported that marketing overhead can drop (12.2 percent) while productivity goes up (14.5 percent) by using automation. Sales could spike by as much as 50 percent in some instances, says JMB Partnership, a marketing agency. Finally, you can see a boost in qualified leads by as much as 451 percent, states Fathom, another marketing agency. From emails to segmentation to contacts management, automation will be a marketer’s best friend into 2019 and beyond. While we don’t have a crystal ball, we’ve studied various insights and other analytics to bring you this article on the future of marketing automation. In it, you can see what is driving automation today as well as what’s to come. Marketing automation software may be more common in recent years, but that doesn’t mean it’s cheap. You could be spending hundreds if not thousands of dollars monthly for this software depending on which company you choose to work with. There are plenty of them out there with more by the day, so your options are practically limitless. You must have room in your budget for your automation software. Not every company out there has been as successful with this as intended, so don’t feel bad if you didn’t necessarily hit the financial mark this year. 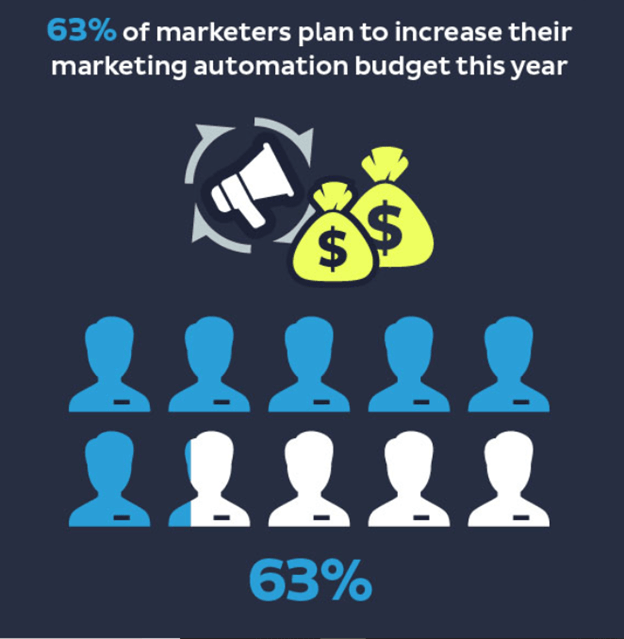 Demand Gen Report, a marketing resource, published a 2018 infographic on marketing automation. In it, they report that most marketers anticipated expanding their budget for marketing automation in 2018. Up to 63 percent of those surveyed told Demand Gen Report they had the need for a bigger budget to pay for automation software. If you can’t necessarily afford to increase your company’s budget in 2019, you could always use EngageBay for your marketing automation needs. We’re an all-in-one marketing suite with automation and a slew of other services. We pride ourselves on being more affordable than the competition. With automation such a popular tool for marketers, it may soon become even more encompassing than it already is. Why stop at segmentation or email marketing when automation can help us with more of our day-to-day tasks? If automation duties continue to grow in the coming years like we think they may, then it’s important the software remains easy to use. 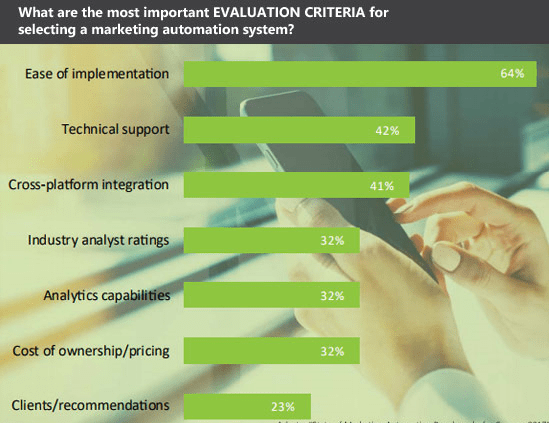 Email marketing company Adestra shared the reasons most marketers want to use automation in their State of Marketing Automation Benchmarks for Success 2017 report. You can see the chart below. Software that’s simple to use was the top reason at 64 percent. This may be surprising to some, as you might assume the main reason marketers would want to automate tasks would be to save time or money. Those are certainly important factors, but they’re not the only driving decisions to consider. The second reason most marketers were drawn to automation is its technical support at 42 percent, says Adestra. Others appreciated the cross-platform integration options (41 percent), the detailed analytics (32 percent), and even the price (32 percent). Finally, 23 percent of marketers were convinced to try automation via client recommendations. As the above stats prove, technical support is at the forefront of many a marketer’s choices to use automation software. After all, some software can be a little complicated to figure out without training. Even if a marketer does master their software of choice, there are always technical issues to worry about. The Internet could fail, there could be internal errors with the software, or hardware could be damaged. What happens then? This is when technical support comes in. Bigger software brands often tout full tech support as a dangling carrot to incentivize customers to shell out more money. That may or may not change, but we think it should. We also think tech support should be more encompassing, with more software companies using automation themselves in the form of social media/email message autoresponders and/or chatbots. This way, if you have a question during the evening hours of a workday or over the weekend, you can get them somewhat addressed right away. If you needed further help, you could then wait for a human to get back to you. And yes, that’s right, we said chatbots. It’s true that some people have their gripes about chatbots, but those that give you guidance or even a solution during a technical mishap could prove to be very useful. Whether all or any of this will happen in 2019 remains to be seen, of course, but with so many marketers valuing tech support in automation, that support should be as accommodating as possible. You’ve heard it a million times before by this point. Content is king, it’s one of the most unique things your company has, yada yada yada. While all that is true, that doesn’t necessarily mean that automation should be kept far away from content marketing. Quite the contrary, actually. 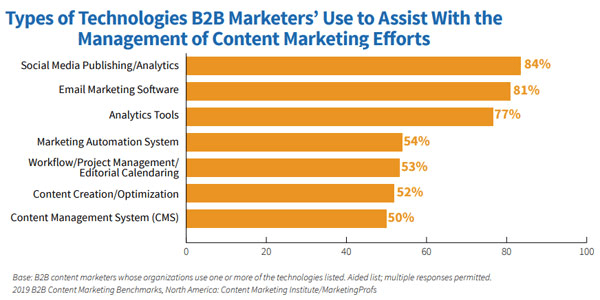 Content Marketing Institute’s B2B Content Marketing 2019 Benchmarks, Budgets, and Trends-North America report notes that more than half of B2B marketers (54 percent) are implementing automation into their content marketing strategies. Most of them, 75 percent, agreed that it helped them get better insights into how well their content is doing. Above are some other ways content marketing and automation intersect. Of those who participated in the Content Marketing Institute’s report, 84 percent said automation aided them in social media analytics as well as publishing. Unsurprisingly, 81 percent of respondents said they could use automation in content marketing for emails. Other interesting points in which automation and content marketing can meet include editorial calendaring, project management, workflow management, content creation and optimization, and the development of a content management system. Don’t misunderstand. We’re not saying you should let automation software write your articles for you. That could be disastrous at worst. At best, your writing would come across as incredibly stilted and you could even get dinged by Google. That said, there’s no reason to separate automation and content marketing with a nine-foot pole. When combined, the two can make for quite an efficient content marketing system. There’s plenty of ways to use automation, but marketers seem to have a strong preference for email automation above all else. Smart Insights and GetResponse’s Email Marketing & Marketing Automation Excellence 2018 report shows us how marketers use automation these days. As the chart proves, more than half of marketers (64 percent) rely on email automation above all else. This automation includes customer onboarding, welcome sequences, and more. The next biggest task automation is used for among marketers is audience targeting and segmentation (26 percent). This isn’t too surprising, either. An April 2018 article published in Towards Data Science found that most marketers are concerned with personalization more so than artificial intelligence. Of those surveyed, 29 percent were focusing more on personalization while only 26 percent were looking to implement AI in their marketing strategies. That doesn’t mean you should ignore artificial intelligence altogether. It’s a growing trend that’s only going to become more prevalent in the next few years. AI can be used for more than powering chatbots, after all. It can also provide detailed customer insights and industry predictions as well as aide in email content. If chatbots become smarter as we mentioned before, then they too can be seen as more helpful than annoying. 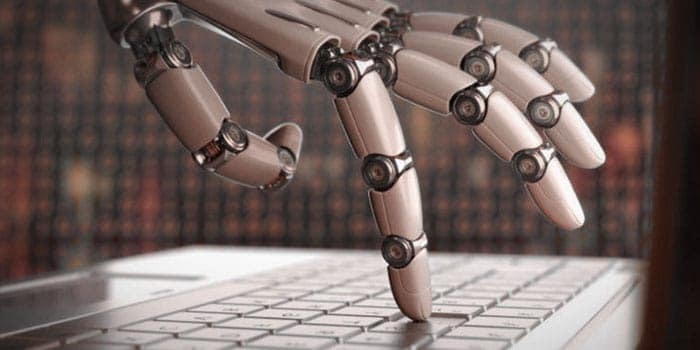 Given the rapid advancements technology continues to make, we could see the reputation of chatbots changing within a year or two if that. Another stat from Towards Data Science notes that customer service can be made better with artificial intelligence. A good chunk of consumers (38 percent) seem to think that way. Having a great company-customer relationship is always important. If automation and AI can aid you in that, then why not use it? We’ve briefly discussed personalization several times in this article, so you had to know it was going to come up sooner or later. After all, it is the prime goal of many a marketer, as Towards Data Science reminded us. Personalized product recommendations may have a 170 percent higher purchase rate over recommendations that weren’t personalized. Revenue, lead gen, conversion rates, and other key performance indicators increased by more than 10 percent for more than half of marketers using personalization (53 percent). Customers like it, too. If they get a more personalized experience, they may be 80 percent more inclined to make a purchase. Personalization is incredibly important for marketing this year, and it will be in 2019, too. How you personalize your content is what matters most. Writing a customer’s name in an email subject line or addressing them in the first line of an email isn’t enough anymore. Marketing guru Neil Patel agrees. He defines personalization partly as “name tags including the receiver’s name in their email campaigns.” While he advocates for de-personalization, and that’s certainly a tactic you can try, what’s clear is we marketers need to be doing something different. What works today? You have to use the customer insights you’ve gathered to hyper-segment your audience. Doing so allows you to create individualized incentives that are ultra-personalized. Not only are you addressing the customer personally, but you’re delivering deals and products right in their inbox that are of interest. You can even extend this to the content you share, embedding the most relevant articles or images, like so. Finally, we want to point out an infographic from marketing company Salesfusion. In it, they state that an overwhelming majority of B2B marketers, 85 percent, admit that they could be using marketing automation better. Further, the report mentions that almost half of marketers (44 percent) said they were “not fully satisfied” with marketing automation. While these stats are from 2016 and we’re sure those numbers have changed, this is a point worth mentioning nonetheless. Automation is not perfect. If you feel like it’s not serving your business the way you want, you have to ask yourself a few questions. Are you using the software correctly? If so, then does your software offer all the features you need? You might need to make a switch if the answer is no. What is causing the dissatisfaction? Is it that you’re not reaching your marketing goals (higher ROI, more conversions) or is it something else entirely? As we said, automation is not perfect. It can’t fill in the gaps of every part of your marketing strategy. It’s also not a silver bullet that can fix everything. It’s meant to aid you in achieving your marketing goals, not do them for you outright. Understanding marketing automation is the key to your company’s success. With more than half of B2B companies implementing or have implemented marketing automation into their respective campaigns, you need to follow suit if you haven’t already. The trends and insights we provided above should give you a solid starting point. You can then formulate your own marketing automation plan for 2019. Good luck!